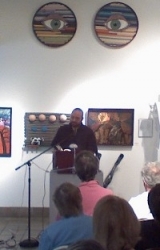 I came down from the hills tonight to hear Timothy Green read from his debut book American Fractal. Tim's work is sonorous, fragmentary, and he reads it well. During his reading a disheveled man kept shuffling papers in his backpack. Afterward, he introduced himself to me as "John," a "published poet." He said he, too, lived in Ojai once, before he lost his home. He reeked of alcohol, making it hard to be near him. "Everywhere I go," he said, "I make the ground safe for barefoot children." Poetry seems to attract highly sensitive people--sometimes vulnerably so--more than other art forms. Perhaps it allows us to protect the imagined children that are our own barefooted selves by picking up sharp fragments wherever we go, and assembling them into something sparkling and musical, as Tim did tonight. Or perhaps, like John, we are simply clearing a pathway, or a place to sleep. I was moved by Tim, whose love of poetry has led him through extensive study, and to editing a well-known journal. I was moved also by John, no less possessed of a poet's turn of mind, who reflected to me, once again, the universality of poetic need. I wish them both a peaceful rest, wherever they lay their head tonight. Categories: Community, Life, and Poetry. Tags: Artists' Union Gallery and Homelessness. Poets: Timothy Green.